This fan assembly comes with all the hardware required to replace the fan in your Kirby even if you currently have a metal fan. Hardware will vary depending on model of fan selected. Fits all G series Kirby Vacuum Cleaners including all self propelled models. This assembly contains all the hardware required to replace your old fan, even if it is metal. 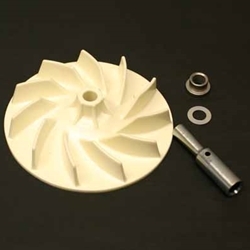 This fan assembly fits all Kirby Sanitronic, Classic, and Heritage Model Vacuum Cleaners.